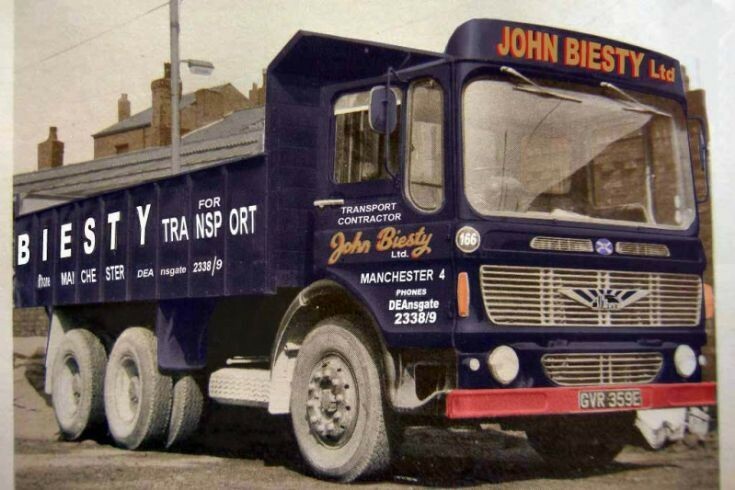 John Biesty Tipper haulier based in Manchester. Ceased trading in 1973 when taken over by Stavley Industries. Albion Riever E reg. Added by Robert Geoffrey Bradley on 04 June 2011.
hi john, yes I do remember george henry I recall he was workshop foreman or chargehand, you are correct brian did wear glasses, alan sadly is no longer with us, he drank himself to an early grave some 5yrs ago. Added by Robert Geoffrey Bradley on 05 October 2015. That is sad news about Alan he couldnt have been very old. I am trying to get hold of photos from back then of the Scammell 8 wheelers they had or any others if you come across any please give me a shout.How are you doing these days anyway? are you married and did you carry on with the mechanicing.The only person I have seen in all this time is Brian Green (castro)remember him ? oh and I once saw Tommy Crompton years ago in a boozer around Middleton and thats it.Do you still live in the area? Added by John Stanfield on 07 October 2015.
hi john, i do remember castro & collar & tie (alan crabtree), i never married, i have been with my partner for 25yrs now, i first knew her when she was 14, out of the blue she phoned me in 1990, i am still on the spanners, again in 1990 BRS where I was working closed down, i joined my dad & brother in the family garage, it is behind biestys off gould street, it is just my brother & myself now, dad died in 2003. Added by Robert Geoffrey Bradley on 11 October 2015. Thanks for the reply good to hear your doing well for yourself.Collar & Tie, you know I could never remember his 2nd name until you have just reminded me and to think myself/castro and him used to go out clubing together every fri night(must be looseing it in old age.So your back more or less where it all started for you all them years ago I get down their quite often may call in on you one day if thats ok with you, whats the garage called. Added by John Stanfield on 13 October 2015.
hi john, by all means call in anytime, church lane garage is the garage name, drive down gould street, just before the railway bridge at the bottom, turn right onto williamson street, we are the 2nd arch on the left, no 39 above the door, looking forward to seeing you again, cheers for now, bob. Added by Robert Geoffrey Bradley on 13 October 2015. Hi, john dont think you will remember me, I was just a kid who used to go with my old fella instead of going school went all overthe country, seemed like that, truth was dont think he was ever out of mamas. Ha ha. Guest who he was yet.allways on the beer. Same era as joe dooley, scrambled egg, gorden roberts, rememember john roberts nick named heavy. Funny, sat here on break and just came across your name. I'm 58 now on nights driving for a waste company called biffa. Remembering back as a kid sad realy time flys most I suppose have passed away. The old man died 2yrs this may. Anyway john will put u out of ur misery his name was Alf Gray. Must go now my 45s up. Take care .Ian Gray. Added by Ian Gray on 05 April 2016. I was in touch with Bob Bradley last month he used to work in the garage with me he now has his own garage along with his brother down in the arches behind where beistys yard was.H keeps in touch with quite a few of the ex drivers who live in the middleton area Tommy Crompton.Alf Elliot.I have been trying to find out if Mr Tom Stephens his still around but had no luck yet, also trying to find out if anyone has any photos of the lorries, I have put one or two on my flickr site but they were ones from when Staveley Ind took them over.Anyway once again nice to hear from you and hope to hear from you again.I myself am now retired 69 next but I have a small van doing deliveries for a freight/courier company from Rochdale just to keep me busy.Has they say once in transport always in transport.dont forget keep in touch.johnstanfield@btinternet.com. Added by on 06 April 2016. Sorry Ian that should have been Arthur Elliott.A few more you may remember.Brian Green/Castro.Alan Crabtree/Coller & Tie.Frank Lane, Eric Lane, Eric Garforth, Jim & Sid Ryan.Dave Hartley.Alf Lyons.Stan Jones.apart from Eric & Frank Lane everyone else enjoyed a pint or two in mamas. Added by on 07 April 2016.